3 Bedrooms, 1 Full Bath, 1 Half Bath, Sleeps 6-8 (bedrrooms sleep 6, recroom 2. This pool house offers three bedrooms, living room with fireplace, kitchen-dining area (open concept) and rec room with sectional sofa and t.v (great place for the kids to kick back). Pool area is very private with over sized deck. BBQ on large deck off kitchen with access to pool. Fully equipped with all your needs. Just bring your clothes. Located in lovely sandwich close to beaches (within 10-20 minutes away). Sandwich offers many tourist attractions and restaurants. Quiet residential neighborhood close to all the cape has to offer. Not in the mood to venture to the beach???? Stay poolside in your own mini private resort!! Business owner, self employed for 31 years. Love this location. Nice neighborhood and close to all. One and a half full baths. A little Gem close to everything! We vacationed in Sandwich at this great little gem. The accommodations were very nice complete with a wonderfully kept private pool area. The whole family enjoyed the tastefully decorated and fully equipped house. And, the location was great, near everything. Our kids had a great time! Robin was available and very accommodating making our stay great. You only need to pack a bag with your clothes and head for this fun location!. My boyfriend, myself , his 12 year old son and his friend rented this house last summer. It was everything we were looking for in a summer rental! The basement is fully furnished, couch, daybed, bathroom etc so it was perfect for the boys to have their own private " mantown" . The kitchen table is plenty big enough, we sat 9 comfortably for dinner one night. The kitchen was also well stocked with plenty of dishes, utensils and cookware. 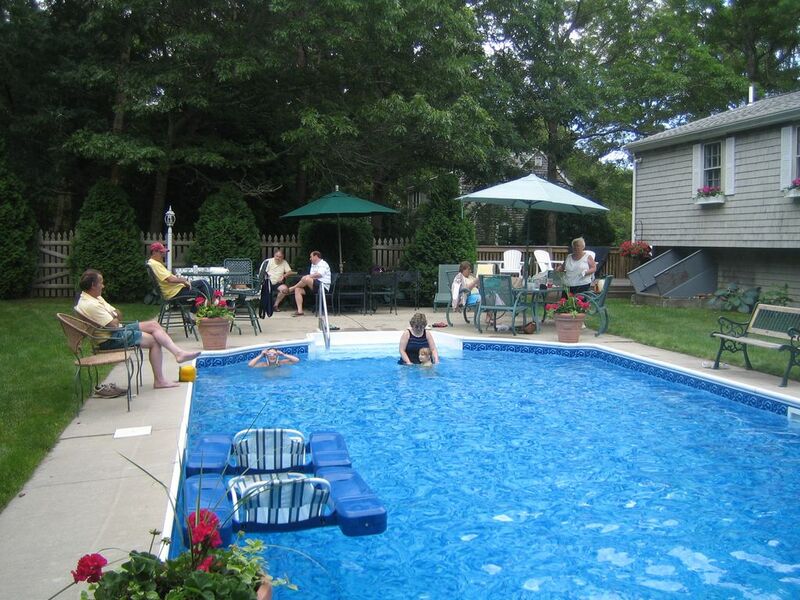 The pool was awesome, lawn well kept and a large deck with gas grill. It's a nice quiet neighborhood but still close enough to major routes. The owner was very pleasant also! We look forward to this summer rental again this year !